©Bert Gildart: Several weeks ago I reported on grizzly bears in Montana’s Glacier National Park, mentioning specifically the sow grizzly bear that park rangers had to kill about a month ago. Smelling the roses. 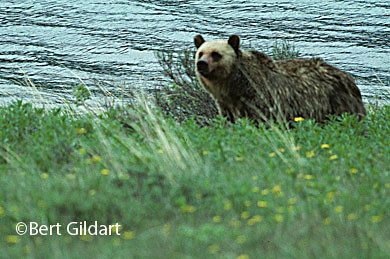 Sow grizzly seen on way to Iceberg Lake, an image that has sold well for me. Since that time, park employees (seasonals and permanents) have met and attempted to resolve differences regarding management procedures. Most seasonals still believe the campground in questions should have been closed and that rangers should not have killed the bear. Permanents say elimination was necessary. Certainly debates are healthy, and probably out of it all management skills required to keep bears wild will only improve. Least anyone get the impression that I am the voice of seasonal employees let me dispel that notion right away. What happens is that as a former seasonal employee, I have many friends who still work in the park, and often we get together in groups for parties. For example, this past week I had dinner with Chris McEwan, an old friend now from Florida who worked with me in Glacier in the early ‘60s. 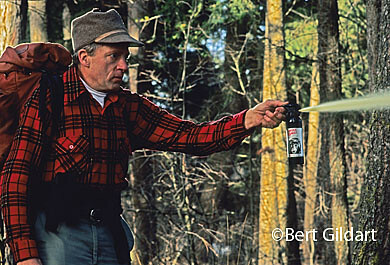 He was staying with Fritz Royer, another friend, and once we all worked on blister rust control (a disease that attacks white pine trees), and did so for a number of years. Though Chris and Fritz are now lawyers, (Chris was once the Flathead’s Deputy Country Attorney) both have kept up with the grizzly situation in Glacier through friends employed in the park. We’re all still very much interested in bears – and concerned about how to keep them wild and out of the news. However, I generally tend to believe we should err on the side of human safety, and fall back on my background of experiences in making this statement. As one of the few rangers who has ever had to deal with all the horrible consequences of a fatal mauling, I believe park managers should consider every tool needed to protect people from habituated bears. But I cheer loudly for the bears, and want assurances that today’s park rangers and biologists will be thoroughly trained. Furthermore, when independent biologists say tools exist to reestablish the wild in previously habituated bears I want to be able to retain hope that those techniques will be considered. Beyond that anyone who visits Glacier must be willing to accept a certain degree of risk, but risk that can be calculated. Of course bears have always made news and right now they’re again topical. This is a late season for berries, and right now service berries are drooping from the branches. Bears love them, so if you are on the park’s east side and want to peer through binoculars and see grizzly bears grazing along the hillsides, this would be an excellent time to camp in the Many Glacier Valley. CLICK FOR MORE INFORMATION AND TO SEE LARGER IMAGE. L to R: Grizzly bear, Many Glacier Valley; grizzly bear munching on service berries, now ripe; branches now heavy with service berries in most of the trails in Many Glacier Valley. This is one of my favorite campgrounds. However, Many Glacier is the precise area in which one of the park’s ten fatal maulings occurred. In fact the Many Glacier area may be the area in which the most maulings have occurred, and here are a few examples. Knowledge of them should help you evaluate those “calculated risks,” for they reinforce the fact that Glacier is not a zoo and that tragedies can happen. On September 23, 1976, a grizzly bear fatally mauled a female camper in the campground. The attack was unprovoked and began while the young lady was asleep in tent. On July 26, 1984, a small 150 pound grizzly attacked a hiker on the trail to Ptarmigan tunnel. The hiker’s male companion punched the bear and it left. On October 24, 1998, at about 2 p.m. a lone grizzly attacked Mrs. Pelland and then her husband, Matt Pelland. According to their report, Matt ran about 20 feet down off the trail, tripped and fell in thick trees, where upon the bear began “eating” his left leg. He sprayed the bear in the face and eyes with an entire can of bear spray, whereupon he then ran for help, heading down Canyon Creek to the bridge and thence by trail to Many Glacier where he reported his missing wife. Mrs. Pelland was later rescued. She reported the bear had knocked her down repeatedly and rolled her over. The bear had also sat on her all in the course of about a minute. Though injuries were extensive, both victims were treated on an outpatient basis. Why all these maulings in Many Glacier? Probably because when Glacier was but an embryonic park, managers authorized construction of the huge Many Glacier hotel in what may well be the world’s best grizzly bear habitat. Many Glacier provides some of North America's best bear habitat. Despite attacks grizzly bear watching is an activity that dominates the very psyche of park visitors, and it is to the park’s credit that fewer mauling now seem to be occurring. Most likely that is because of increased trail closures, usually temporary but necessary when bears move into an area, and because of education. For instance, signs are posted everywhere, and once I made a tally counting something in the neighborhood of a dozen different signs used to inform people about the nature and the presence of bears. As well, hikers who intend to backpack overnight are required to watch an educational video. There’s also much information on how to camp in the front country, which includes the proper preparation and storage of food. Perhaps another big factor is the use of pepper spray, now carried by most hikers. It seems to work, and work well. In fact, Rick Millsap, a former Glacier Park Ranger and good friend, says he has used it several times, both in Glacier and in Wrangle St Elias, where he now serves as a park ranger. With it Rick says he has turned charging bears. Lesson: carry bear spray, such as Counter Assault. So what will Janie and I be doing? We’re firm believers that we’re safer in the backcountry of Glacier than we are driving roads in the Flathead, and that goes into our equation when calculating our risks. In fact, statistically, park maulings are way behind such common activities as swimming and hiking, which always seem to count for several of the annual deaths the park invariably experiences. So maybe we’ll see you in the park. Most likely, you’ll hear us before you see us. 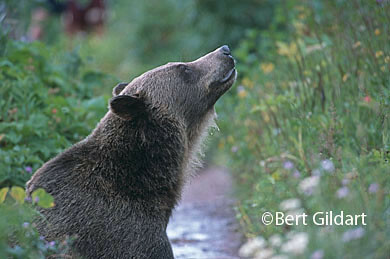 We like to sing as we hike, particularly when rounding blind corners, and that helps to keep the bears away. We like Bruce Springsteen’s “Glory Days,” and that seems to work, as we’ve never surprised a bear while crooning such spirited ballads . This entry was posted on Tuesday, September 29th, 2009 at 9:15 am and is filed under Glacier National Park, Montana Photography, Photography, View Point. You can follow any responses to this entry through the RSS 2.0 feed. You can leave a response, or trackback from your own site. I’ve been following the coverage of the bear removal through your website and Glacier’s website. Very interesting debate and I had not given much thought to the fact that there is a difference of opinion between seasonal and permanent employees. Very interesting. As I’ve said before, as a recent public administration graduate, I can understand and appreciate the complexity of the issue and the difficult decision before park administrators. Thanks for following this event and writing about it. Having just visited Glacier NP (not to mention grizzly bear country) for the first time this year, it had a huge impact on me. I am hoping to spend more time in the park next summer where I will be equipped once again with my bear spray and excited to hike the trails! And…Glory Days…I’ll give it a try!